Home Blog Running your first marathon? 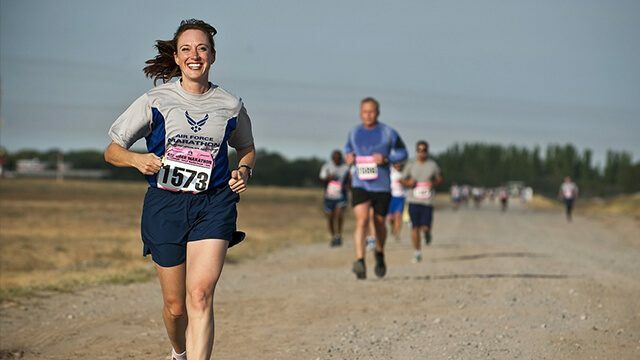 If you have been keeping your dreams of running a marathon in the bucket list, then it’s probably a good time to start. To run a marathon challenge is by itself an arduous task. After months of training and going through the schedule that you have been told works best, the feeling of being at sea is still lingering. The first one is always the most difficult, but with proper training and strategy, you could prevent those awkward situations that make you leave the race without completing it. Here are a few suggestions for those looking up for their first marathon preparation. Start your training 3-4 months prior to the race. This serves as the minimum criteria to get your body ready for the heavy work that the muscles require to accomplish and also mentally prepares for the challenge that lies ahead. Keep record of your timings, improvements, and things that work best for you like the food to eat before starting, or the drinks that get you going. Stretch every day before starting training and also before the race as this keeps the muscles in the right state to take any strain. Also, after each training or race, relax and give your body some pampering with massage and yoga. The right choice of shoes is very essential to any outdoor activity, and marathons are even more reliant on their comfort. It’s worth some time to research for the right shoes in the market, and test it thoroughly. New shoes are a big no for any runner. The comfort and patience to continue on the race is also reliant on proper clothing, one that regulates the temperature of your body properly and also keeps you dry. Determine what gear you need to keep going in the race and set an extra pair if you think you need it particularly for the race. Use proper lotions and lubricants to avoid blisters on your toes, sunburns or chafing the legs. Athletes are often seen following strict instructions from dieticians before a race. The main purpose is to give the body the right kind of nutrients that support a particular discipline. So, while many would just go and grab any food to pacify hunger, get the right ones your body asks for. More carbohydrates in the diet is what most trainers suggest. Fatty food gives bloating feeling and makes the body feel heavy. Also protein intake is necessary to help build the muscles. Vitamin and mineral supplements are essential to keep the body turgid and increase immunity. It’s a good idea to eat something light before you go for training, and this even applies for the race day. Water and the salt that is lost with sweat are other things that we need to fulfil to keep the body in a good condition. Drink enough water, yet don’t overdo. Also, electrolyte consumption would help to cope up with the mineral lost from the body. Many think that sports is for the body, and tend to forget that a proper state of the mind is also utterly essential. Separate some time in your daily schedule for meditation, or engage in activities that calms down the mind. This gives a better control to the strengths of the body, knowing when to push more or when to set back. It’s a good idea to listen to music as this keeps you relaxed and positive about the exercise routine. It’s definitely not a good idea to take in a heavy meal just before the race day. A proper full meal of carbs that would keep your body properly loaded with energy should be scheduled 48 hours before the race. After that, eating a balanced diet and avoiding alcohol and caffeine is best recommended. These ensure that your sleep is not disturbed in any way. Just the day before the race, it would be a good idea to do some basic stretching and take your body on a less intense run to keep it fresh. Also after the race, its best to get properly hydrated and relax the muscles to get back into shape and continue training. Next articleCould fat bikes be the face of new adventure cycling?